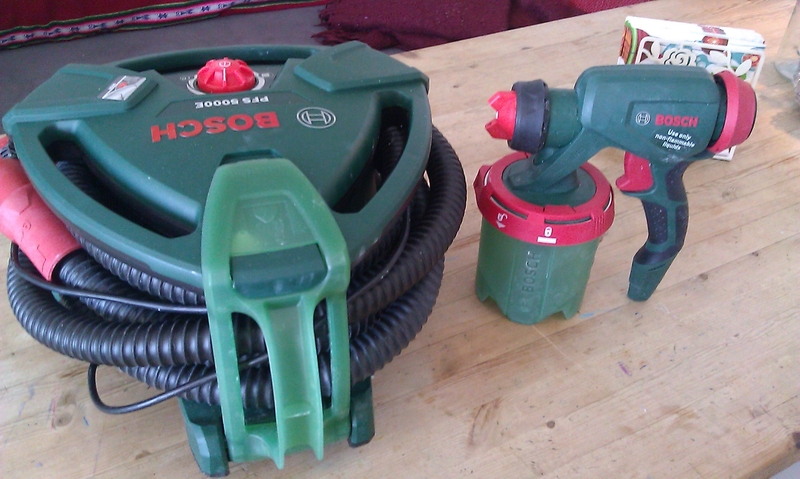 We are now the proud owners of a Bosch PFS5000E home paint sprayer for interior and exterior work. As you can see, it is a reverse vacuum cleaner type system. We have about 120 square meters of house walls and a partitioin wall to prime and paint, so we were tempted to look at hiring or borrowing one, but a best price unternet was also in a nearby shop so we jumped at it. Why the interest ? Well it will get the job of painting done quicker and given wind still conditioins, a lot cleaner than paint brushes. 15 good qaulity paint brushes and it has paid itself anyway! @1398kr (~1600€) it is quite a big outlay for something not in prof’ use, but it can always be “e-bayed” away. We need quick because the weather window here is April-May-June to get the three-four layers on. After that it is usually warm and monsoon season, plus the Pine pollen and sahara dust….not to mention school hols. Today was a test of about 8 m on a wall -fence which has never been painted, testimony to the impregnation Scandinavian sawmills treat their wood to. Youtube shows how it works and how directed and confined the spray is in at lesst wind free conditioins. This was just wood primer and since it is a fence, we weren’t allnthat fussed if it is uneven. That prove to be the case as i let it either go to close or linger over some points, where I later brushed out the drips. A final top coat on a warm day could be a messy result without practice. Previous spray painting experience I have amounts to my annual touch up of our now “vintage” Citroen. Surprisingly it is quite similar to using spray can paint in not being very violent, yet it puts out a larger and maybe more concentrated volume while being constrained. The system is it seems constrained by a few innovatioins – it uses about 1200W like a good Hoover, but seems to compress further to about maybe 3 to 5 BAR by blowing into paint can and using three nozzles. There is the familiar pin and cone, where the cone is changed out for the different viscosities of paint, from thin varnishes and primer to hevier outdoor oil paints. Then there is a kind of spider’s tallon double jet either side of the main nozzle which can be rotated to give a vertical or horizontal ‘oval’ in the paint hit zone. I guess these create a vortex of air which leashes the main spray within its boundary layer. That’s the ckever bit out of the way. Now let me get onto the slight reality check of the system – how much utility is there in it for the average DIY’er ? Let me tell you how it went….. The primer was almost as thick as ordinary paint, but looked like ‘grey nozzle’ ie thinnest land. Given very quick strokes it was – a nice even coat as if you had loaded your brush lightly and it had magically replenished itself for the whole plank! However that was working fast – covering 6 feet vertical by 15 cm ( 185 x 15) in about ten seconds flat! Any pauses in a failry rapid sweep were scolded by dripping signs of over saturation. I felt like I was working for it, not that it was working for me ! It was hurried. Carried away! Fast though – maybe half an hours brush-and-can done in three minutes including refills. The next issue would have been more obvious had i been spraying sills or car doors. The fence used an overlapping verticle plank build, so the inside edges were a little under painted. Also unlike car spraying which is about twenty square meters masking to one sqaure centimeter spray area, i had done a perfunctory application of news paper with stones, forgetting about where it meets the house wall or just how much paint you can get on any nearby surface in any axis. So a brush or two were needed afterwards. But since the spraying took three minutes, doing some edges and smoothing out some runs took less than 10 mins. Some areas were a bit dry looking, either they were a bit knotty or very adsorbent, again 2 mins with a brush. On a warmer, windless day i would have been very tempted to dilute the primer about 10% ( recommended only five) with white spirits or thinners as on the box, and take a quick tea break between two coats, due to old wood sucking up so much bloody primer in an uneven way. The first bug bear then is the speed it all goes at, the pace you seem to need to work to. This is just by in large caused by watchung too much Wheeler Dealer snippits of men hurridly applying nano thin coats to old jaguars. There is a trigger and this is flat wood not a curvy car in need of six coats or more. Also you can adjust the nozzle gap with a the index ring 1-5 for increasing amount of paint. To maintain the right atomisation you can turn the blower up or down – up for finer, which can become fly-away as mine were today, or coarser. You need more air suppky as the viscosity increases, and this is the pkus of the PFS5000e over the smaller, over shoulder 3000 which needs mostly thinned paint substrate to operate well. The rub for me today was thst i used 2 L total in three refills because it stops working with about 150 ml left and is a bit full looking at the litre mark. It comes with two paint pots for quick change overs. However this means about 14 refills when I come to do the main 60 m2 wall. That probably compares in fact well enough to down time to wash paint brush handles, decant paint into more scaffolding friendly cans and so on. The speed of application relative to the lack of mess is just astounding though! Technique and settings need to experimented with for EACH new paint you choose, qith a handy test board to hand. Hence it pays off only if you have a bigger job to do, or are prepared to do trial and error to get perfection for somethinglike say a favourite chair. I now have 90m2 of walls to do, all of which is overlapping angled weather facia cladding, most of it will be new wood. So i am thinking there will be a horizontal approach with two different angles to cover about 160mm per pair of horizontal planks. Spray ‘talons’ set horizontal which makes a vertical oval pattern which you then draw horizontally if that makes sense. I will set it a bit lean nozzle on medium air speed which i think will lend itself to a more sedate rate of work, passing to my age and position in life. Experiments will include a board, but also some degree of using a brusn to cover my tracks…..hopefully just on the first square meter! Now though, comes then final and rather nasty sting in the tail – time after you are finished, and white spirit or thinners. You need a lot, and with environmental taxes it is rather a nasty extra cost. A full clean of the system and any drops on the exterior will use 3L solvent ! I spent 3 minutes spraying and maybe 45 mins cleaning and packing away! Messy in use, it isnt ! It was really far too windy for painting today, but slightly un the lee it worked fine. Also you can paint within about 20 cm of window frames and what have you before you bother to either mask up with the Oban Times, or opt for a brush. I wouldn’t otherwise rush out and buy one if i were you , but we have perenial am-dram’ theatre scenery to paint and want our house done now before summer and with a sale likely within two years , maybe a fine mist of a new coat over the top appeals. The new house may well need TLC or a new colour scheme too, or my dream of a clsssic day sailer may come to fruition. This entry was posted in Uncategorized on April 23, 2016 by keithlmelvin.